How about USA made quality without the price? That is exactly what you will get when you have one of these Gerber Order knives. 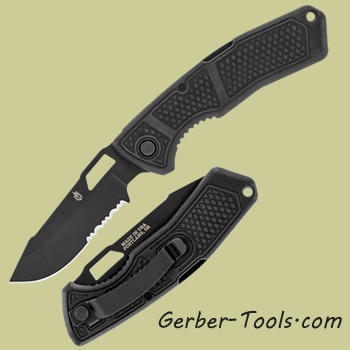 The Gerber Order model 30-001011 is completely blacked out on both its blade and its handle. Weighing in at only 2.6 ounces this knife still fills up big hands with its 7.6 inch overall length. The blade steel is the good old American Made workhorse steel - 420HC. The handle has a lockback that keeps the blade in place when it is open. The lockback has a refreshing departure in this world of gadgetry because it is so solid. Sometimes it is just good to get back to the basics, and that is what this knife does for you. Get you one of these, the Order will be around for a while to keep your life IN ORDER!